DUBAI/LONDON (Reuters) - Budget needs are forcing Saudi Arabia to push for oil prices of at least $70 per barrel this year, industry sources say, even though U.S. shale oil producers could benefit and Riyadh's share of global crude markets might be further eroded. Riyadh, OPEC's de facto leader, said it was steeply cutting exports to its main customers in March and April despite refiners asking for more of its oil. The move defies U.S. President Donald Trump's demands for OPEC to help reduce prices while he toughens sanctions on oil producers Iran and Venezuela. The export cuts are designed to prop up prices, sources close to Saudi oil policy say. Saudi officials say the kingdom's output policies are merely intended to balance the world market and reduce high inventories. "The Saudis want oil at $70 at least and are not worried about too much shale oil," said one industry source familiar with Saudi oil policy. Another source said Saudi Arabia wanted to "put a floor under oil prices" at $70 or slightly lower, and added: "No one at OPEC can talk about output increases now." Officially, Saudi Arabia, which plans to raise government spending to boost economic growth, does not have a price target. It says price levels are determined by the market and that it is merely targeting a balance of global supply and demand. Even a price of around $70 a barrel would not balance Saudi Arabia's books this year, according to figures cited by Jihad Azour, director of the International Monetary Fund's Middle East and Central Asia department in February. For that, he said, Riyadh needs oil prices at $80-$85 a barrel. Saudi Arabia, the world's largest oil exporter, also wants to make sure it avoids a repeat of the 2014-2016 oil price crash below $30 per barrel, sources familiar with Saudi policy said. Saudi Arabia plans to reduce March and April oil production to under 10 million barrels per day -- below its official OPEC output target of 10.3 million bpd. A Saudi official told Reuters this month that despite strong demand from customers, state oil giant Saudi Aramco had cut its allocations for April by 635,000 bpd below nominations -- requests made by refiners and clients for crude. Saudi Energy Minister Khalid al-Falih said such swings were not unusual because last year the kingdom had raised output and exports above targets to avoid imminent shortages. Saudi Arabia has also been advocating an extension of OPEC-led supply cuts beyond June until the end of 2019. Russia, which is not an OPEC member but is cutting output in tandem with OPEC, can balance its budget at oil prices of $55 per barrel and has not made clear yet whether it is prepared to extend them when OPEC next meets in June. "With budget needs at above $85 per barrel, the Saudis desperately need prices at above $70 per barrel," said Gary Ross, CEO of Black Gold Investors and a veteran OPEC watcher. "They also need to convince Russia that the strategy of output cuts makes sense despite the loss of market share to the United States," he said. The United States and Russia produce 12 million and 11 million bpd respectively. Unlike Russia, the United States pumps at will via its commercial energy sector, led by shale. The International Energy Agency forecasts its output will soar by another 4 million bpd in the next five years. Those increases would be likely to outpace the growth of global demand and give Washington an even bigger share of the global market, making it a bigger exporter than Saudi Arabia. Riyadh has long been a close ally of the United States and the two countries have coordinated oil policy more closely since Trump became president than under his predecessor, Barack Obama. 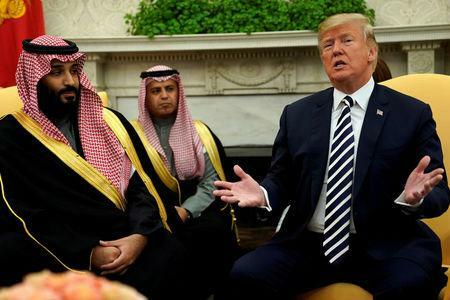 Trump has supported Saudi Crown Prince Mohammed bin Salman despite a global outcry over the killing of journalist Jamal Khashoggi, a critic of the Saudi government, and has made clear he expects OPEC to help lower global oil prices. Last year, Saudi Arabia raised output steeply under pressure from Washington. But it later heard that the United States had granted Iranian oil customers unexpectedly generous waivers and the price of oil subsequently fell to $50 per barrel. On Monday, OPEC and its allies, led by Russia, scrapped a planned meeting in April and will decide instead whether to extend output cuts in June, once the market has assessed the impact of new U.S. sanctions on Iran due in May over its non-compliance with a deal to curb its nuclear program. "We have to wait and see what the Americans will do first," a second OPEC source said. There is, however, no guarantee Saudi policy will remain unchanged if Washington puts pressure on Riyadh to raise supply. "They (the Saudis) do care about Trump, but they can't do whatever he says every time," an OPEC source said.